The Cathedral of St. Joseph, a blend of Romanesque and French Renaissance styles, is built on a bluff overlooking Sioux Falls, SD. It was consecrated in 1919 on the site of the first church in the diocese, a wood-frame church that was destroyed by fire in 1881. The current cathedral replaced a brick church that was built in 1882. The idea for the new cathedral came from Bishop Thomas O&apos;Gorman, originally from the Diocese of Saint Paul, MN, who became head of the Sioux Falls diocese in 1896. He attended the dedication of the 1905 cathedral in Saint Paul, designed by Emmanuel Louis Masqueray, and asked the architect to design a cathedral for Sioux Falls. Educated at Ecole des Beaux-Arts in Paris, Masqueray came to the U.S. in 1887 to work for Carrère and Hastings. 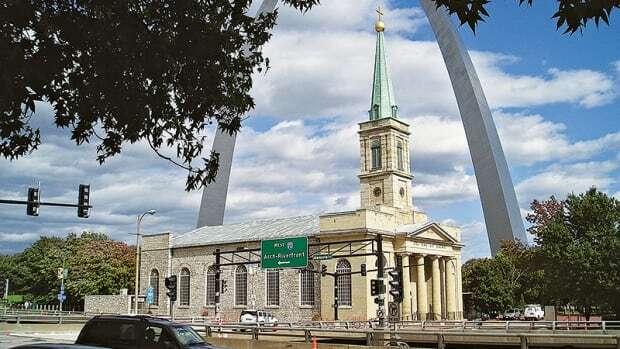 In 1893 he opened his own firm, Atelier Masqueray, and was the designer of the 1904 Saint Louis World&apos;s Fair, as well as the Cathedral of Saint Paul in Minnesota, and numerous other projects, mostly ecclesiastical, in the Midwest. He was also involved in a number of major projects such as the Metropolitan Museum of Art while employed by Richard Morris Hunt. Masqueray went to work on the Cathedral of St. Joseph in Sioux Falls and the cornerstone was laid in 1916. However, Masqueray died suddenly in 1917 and the project was completed by his draftsman Edwin L. Lundie. The first mass was celebrated in an unfinished cathedral on December 8, 1918, and dedication took place on May 7, 1919. The cathedral is 178 ft. long x 119 ft. wide with bell towers extending 163 ft. above the floor. It is built in a crucifix form and has been altered many times over the years. A pipe organ was installed in 1935 and the interior was renovated in 1943 after a fire in the basement caused significant damage. In 1946, a marble high altar was installed and in 1947, French stenciled stained-glass windows were added. A major renovation project took place between 1970 and 1974, including the addition of new freestanding altar. In 2004, a new Sacred Heart Chapel was created in the sacristy. In 2007, His Excellency Bishop Paul J. Swain began the restoration of the interior with Duncan G. Stroik as the architect. The exterior had already been restored a few years before. 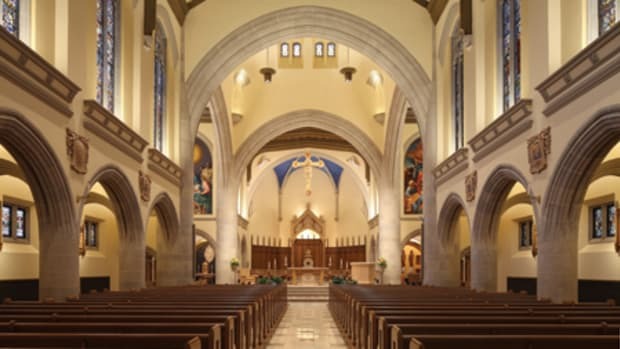 Swain and Stroik refer to project as a "creative restoration," because "the goal was to restore the interior to the splendor envisioned by Bishop Thomas O&apos;Gorman and Masqueray," says Duncan Stroik, AIA, principal. "This is our largest restoration project," he adds, noting that most of his firm&apos;s work is new construction. "Our work here was limited to interior; the exterior had been done 10 years before. The other point is that this was a &apos;creative restoration.&apos; The bishop wanted it to look like Masqueray had designed it. I tried to put myself in his shoes. That was a lot of fun, and challenging." "When I first saw the cathedral, I thought &apos;this is a really amazing piece of architecture and people can&apos;t see it,&apos;" he notes. "It had dark stained glass, lights shining down, and was painted beige. It was encrusted from having been painted many, many times. You couldn&apos;t even see the ornament in the ceiling. I knew that if we brought it back to life, it would reveal the beauty that was there, that had been missing for maybe 50 years." 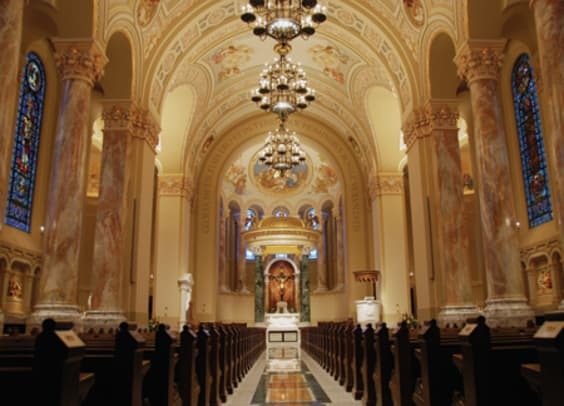 With this in mind, Stroik and his colleagues redesigned many of the elements of the cathedral to align with Masqueray&apos;s original intent, after having visited and studied many of his churches in the Midwest. The project encompassed the wholesale redesign of the sanctuary, including the addition of new elements, such as a new circular baldacchino, the pedimented cathedra and a cylindrical ambo. In addition, a modern cosmatesque floor and decorative painting were designed to be congruent with motifs in the cathedral. To start, the sculpture and decoration that had been painted a beige color during a 1970s restoration was restored based on paint schemes found at other Masqueray churches. For example, 10 circular motifs in the ceiling containing figures of the 12 apostles were repainted. Four of the apostles appear as two pairs sharing a roundel. The decorative painting was executed by Conrad Schmitt Studios, who had also decorated the cathedral after the fire in 1942. In addition to painting all of the reliefs including the medallions in the ceiling, the Stations of the Cross, and the Nativity in the apse, Conrad Schmitt Studios also restored the plasterwork and added faux marbling on the six columns (37 ft. tall) in the nave and elsewhere. The bases of the columns were redone in Arabescato Vagli marble. "It was a big project," says B. Gunar Gruenke, president of Conrad Schmitt Studios. "Everything had been painted one muted color. We had done decorative painting in the &apos;40s, but elected not to go back to the 1940s scheme, but to execute what Masqueray would have done had he painted the church. We studied his other cathedrals in St. Paul and Minneapolis and found that those two palettes were very similar. So we were able to create a palette that was sympathetic to Emmanuel Masqueray&apos;s wishes." "There was a high level of artistry," he adds. "For example a typical capital would have involved six or seven steps, including the primer, base paint, glaze, second glaze, cut-in additional background areas for additional depth, and then dry-brush flashing on the tips to create highlights." "When marbleizing the columns we would typically use turkey feathers to produce the veining, but in Sioux Falls we used pheasant feathers," Gruenke explains. "South Dakota is the pheasant hunting capital of the world. We had parishioners bringing in pheasant feathers. It made it more personal." While the existing columns in the nave were marbleized, real marble was used extensively throughout the cathedral. In fact, 23 different types of marble from around the world are incorporated in the redesign. "It&apos;s the largest amount of marble that we have ever done in a project," says Stroik. "It was fun, and it was in keeping with Masqueray&apos;s other cathedral, so it was the right thing to do. Most of the new fabrication including the flooring, baldacchino, the cathedra (bishop&apos;s seat), the ambo and pulpit, was in marble and was done in Italy." The new circular baldacchino designed by Stroik incorporates four 8,000-lb. marble columns with shafts made of Verde St Denis marble from France. They measure 1 ft. 10¾ in. in dia. and are 15 ft. 83/8 in. tall. The 2 ft. 2½ in.-tall composite capitals are hand carved from carrara unito marble and tipped with gold leaf. These columns were so heavy that they had to be craned into the church and placed on a temporary platform at the entrance to the cathedral. They were then rolled into position on wheels and a specially designed winch system put them in place on their marble bases. One of the features of the baldacchino is its domed ceiling, an idea by Stroik to replicate domes found in other Masqueray churches, but missing at the Cathedral of St. Joseph. "Most of the shapes in the interior are circles, arches and curves," says Stroik. "I thought there was something missing – a dome. Since we couldn&apos;t add a dome to the crossing, and Masqueray didn&apos;t intend that, then why not give a dome to the altar?" Stroik also carried the circular image into the shape of the baldacchino itself. "I have designed a lot of rectangular baldacchinos and I would never have thought of doing a circular one except that Masqueray designed one for St. Paul," he explains. "It was very difficult to design, and the bishop was very concerned about it. Once he saw it, though, he loved it." 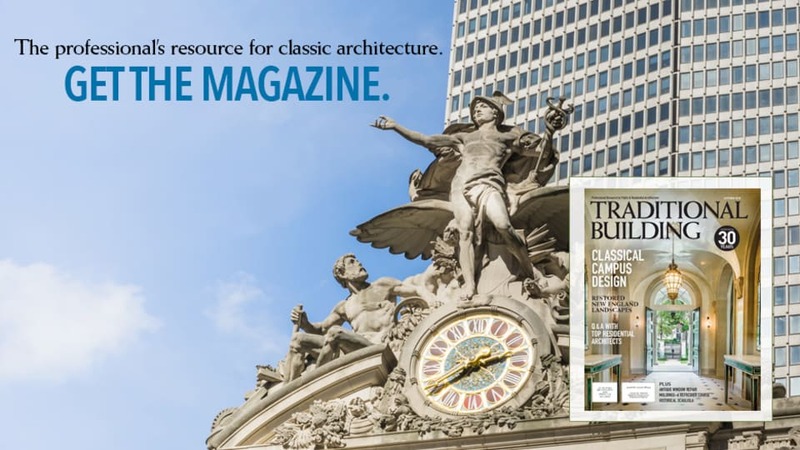 "The baldacchino columns are a beautiful verde green marble," says Stroik. "Originally it was going to be a Turkish red, a beautiful dark red, which the Italians call Rosso Barocco but they couldn&apos;t quarry it in large enough blocks. The bishop had to make a decision, so we looked a lot of different marbles and he picked this beautiful rich green with complex veining." Structural upgrades were required to accommodate the new baldacchino, including the demolition of the thrust stage and the addition of level flooring to accommodate the baldacchino, altar and high altar. The altar under the baldacchino is one of the many elements designed by Stroik. It is embellished with cherubim, swags and wreaths of laurel and was hand carved in Calacatta crema marble, the same marble used for the cathedra, ambo, tabernacle and baptismal font. The new marble altar and the high altar, baldacchino columns and tabernacle were fabricated by Italmarble Pocai S.r.l. of Italy and Paolo Costa & Co. of Italy. They also collaborated to fabricate the baptismal font, the new marble ambo, the cathedra, the side shrines of St. Joseph and the Blessed Virgin Mary. Cody Swanson of Florence, Italy, sculpted the bas relief in the cathedra pediment, the angels for the baldacchino, the Trinity relief on the baldacchino ceiling, the Holy Spirit on the ambo sounding board ceiling, and iconography for the ambo and side altars. He also sculpted the bronze tabernacle door and bronze crucifix. One of the most significant challenges was creating a complex but uniform floor pattern within the confines of the existing space. When the existing monochromatic stone floor was removed, it left a setting bed that varied from 1 to 3 in., so it had to be reconfigured before the new marble slab flooring could be installed. The floor consists of 10 different marbles fabricated by Italmarble Pocai of Italy and installed by Twin City Tile and Marble of St. Paul, MN. This new cosmatesque (geometric with inlay stonework) floor pattern draws its name from the Cosmati family who worked around Rome around 1100, Stroik notes. "Masqueray liked simple monochromatic floors," he says, "but the client wanted a beautiful marble floor, so we came up with one that would fit. You see circles in the bas relief, in the windows and in the ceiling; circles are used all over the cathedral. We took the design from that." One issue that came up during the design process was what to do with the 1940s high altar. "Other than the nativity scene in the apse, it was the most elegant element in the building," says Stroik. "I liked it very much. It was a beautiful yellow marble altar, very Art Deco, fairly ornate, with square lines. In my earliest design I kept it. The bishop felt it competed with the circular baldacchino and that it didn&apos;t fit in with the Masqueray design, so we replaced it. That was a difficult decision because it was a beautiful piece of work. "Certainly what we did was more in keeping with what Masqueray would have done. We put the original altar in storage and there are plans to reuse it in another church." Another issue was where to insert a coat of arms. "One of the things I try to do is to put the client&apos;s signature somewhere," Stroik notes. "I wanted to put his coat of arms on the floor in the narthex. We have done that in the past. He was very uncomfortable with that; he doesn&apos;t like to call attention to himself other than the coat of arms over the cathedra, which changes with a new bishop, but he didn&apos;t want anything permanent." "Eventually the bishop decided to put a coat of arms from the current pope, Benedict XVI, and another from Pope Benedict XV, who was pope when the church was first built, in the narthex floor," he adds. "That was a nice symmetry." Many other changes were made during the restoration, including replacing 1970s aluminum and glass storefront entry doors with custom wood doors and transoms matching the original drawings. These new solid white oak entrance doors are 4 to 5 ft. wide and 12 ft. tall, and were fabricated by Saint Paul Fabricating of Saint Paul, MN. New lighting was also a consideration. 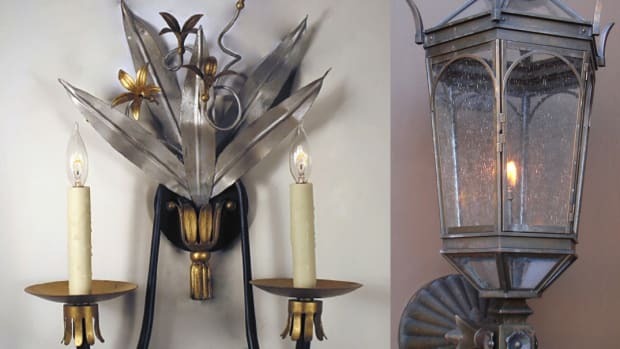 Aurora Lamp Works of Brooklyn, NY, created 19 new chandeliers for the cathedral, based on historic photos. The nine large chandeliers in the nave and transepts measure 8 ft. in dia and are 11 ft. tall, while ten smaller ones in the aisles are 2 ft. 6 in. wide and 4 ft. tall. They are made of aluminum to minimize weight and are adorned with solid-brass and brass-plated details. The narthex light fixtures, the sanctuary lamp, and some of the exterior lighting were restored. Down lighting at the nave and uplighting for the ceiling was accomplished with the addition of a new canopy to the chandeliers that conceals numerous high-tech fixtures. Stroik worked with lighting consultant George Sexton Associates of Washington, DC, on this project. 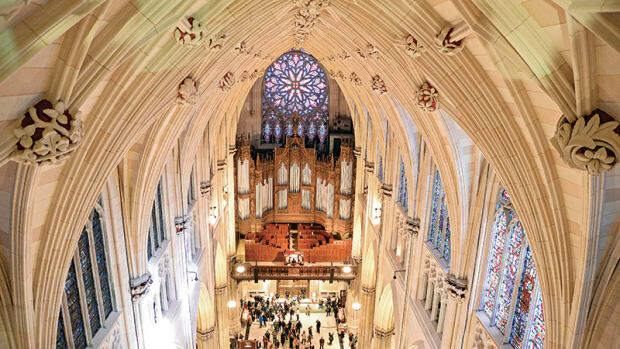 The 1920s seating was reconfigured because people were smaller then, Stroik says, adding that some seating was lost, but the cathedral now seats 900. The ornate wood pew ends were restored and the veneered bodies were replaced with solid wood by Dakota Church Furnishings, Dickinson, ND. Some of the pews have special hardware that allows them to be removed for special events, like the "Christmas in the Cathedral" concert. A movable lectern, chancel screens and new richly carved wood confessionals (matching the originals removed in the 1950s) were fabricated in white oak by Merritt Woodworking of Mentor, OH. This firm also supplied the new hand-carved wood bishop&apos;s chair that fits into the marble pedimented surround. During construction, two bas reliefs of Saint Cecilia and King David were discovered hidden behind the organ, and were restored by Conrad Schmitt Studios. In addition, a new mechanical system integrates air conditioning into the cathedral by removing radiators and inserting supply ducts behind the existing wrought-iron grilles. Historic heating grates in the floor of the nave and transepts were reused for the new return air plenum. And, a large speaker that hung from the crossing was replaced with a new state-of-the-art line array supplied by Audio Connections, Brookings, SD, to blend in with the walls. The acoustical consultant was MuSonics of Grand Rapids, MI. Other suppliers include Saint Paul Fabricating and Decorating,Saint Paul, MN, (ironwork); Tessier&apos;s Inc. HQ, Mitchell, SD (mechanical); Muth Electric, Inc., Mitchell, SD, (electrical); Willey & Associates, Inc., Hot Springs, SD, (television systems); Assoc. Consulting Engineering, Sioux Falls, SD, (M.E.P. engineer); Structural Engineering Assoc, Sioux Falls, SD, (structural engineer); and Sioux Falls Construction, Sioux Falls, SD, (construction manager).